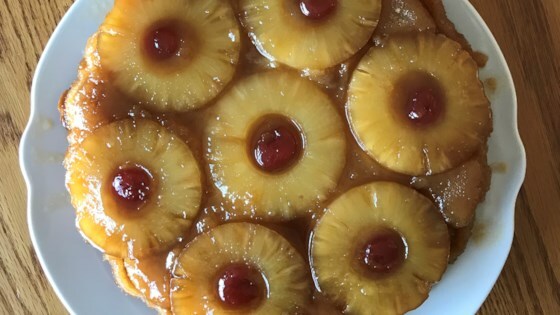 "This recipe was given to me by a good friend in Hawaii. She always uses fresh pineapple, the end product is delicious. Very yummy served with ice cream or whipped cream as an accompaniment." In a small bowl stir together the melted butter and the brown sugar; spread the mixture evenly in a well buttered 9 inch round cake pan. Pat the pineapple very dry between several sheets of paper towel, and arrange it evenly on top of the sugar mixture. Sift together flour, baking powder, salt, and cinnamon. In a large mixing bowl, cream the softened butter with the sugar until the mixture is light and fluffy. Add the eggs, one at a time, beating well after each addition. Stir in the vanilla. Add the flour mixture in three parts alternately with the milk, beginning and ending with the flour mixture. Beat well after each addition. Spread the batter evenly into the prepared pan. Place the cake in the middle of the oven. Bake for 45 to 55 minutes, or until a tester comes out clean. Let the cake cool in the pan on a rack for 15 minutes. Run a thin knife around the edge, and invert the cake onto a plate. Serve the cake warm or at room temperature. I made this in a 9x13 pan and I was a bit nervous that the batter was spread too thin. But I lessened the baking time to 20 minutes and it came out perfect. This was delicious.